Having developed a large range of Hydraulic Press Machines for over 65 years, Lien Chieh Machinery (LCM) has expanded their product range by offering specialized Mechanical Presses and C-Frame Hydraulic Presses. All of our latest Hydraulic Press Machines incorporate cutting edge technology and are manufactured using the latest production techniques to ensure high performance and precision results. LCM’s C-Frame Hydraulic Presses are very popular for their high accuracy, efficiency and versatility as they can be designed for various metal or sheet metal applications. We can also custom build C-Frame High Speed Presses designed for large operating spaces that are suitable for both automatic operations and multi-press assembly lines. All our C-Frame Hydraulic Presses use a main cylinder that is designed for High Speed Pressing operations and efficient power use. 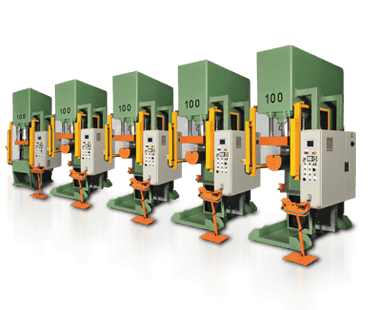 Furthermore, all our C-Frame Hydraulic Press Machines and High Speed Press Machines are designed with a highly rigid structure and uneven loading resistance for long lasting precision. By always understanding our customers’ requirements and designing machines in cooperation with them, LCM is able to design Press Machines that perform at the highest level, day in day out.